I was asked to review Alphabet photography by Artistic Letters. Photographer Jodi Gerber of Artistic Letters has created an entire catalog of black & white letter images throughout the past 3 years – all by taking photos of objects in nature that resembled letters of the alphabet. She recently decided to offer an ENTIRE catalog of her 250+ letter images to the public on CD or Download so that anyone could create their own designs! These letters are beautiful, so creative and a great way to make artwork for your home as well as other projects like greeting cards, wedding invitations, graduation announcements, or photo keepsakes and gifts. The possibilities are endless. There are so many unique versions of each letter. I was determined to use as many as I could on each project. I made 2 scrapbook pages, and a wall hanging. The first page, I decided to spell my first name, “Jennifer,” which I never go by, just to use more letters! 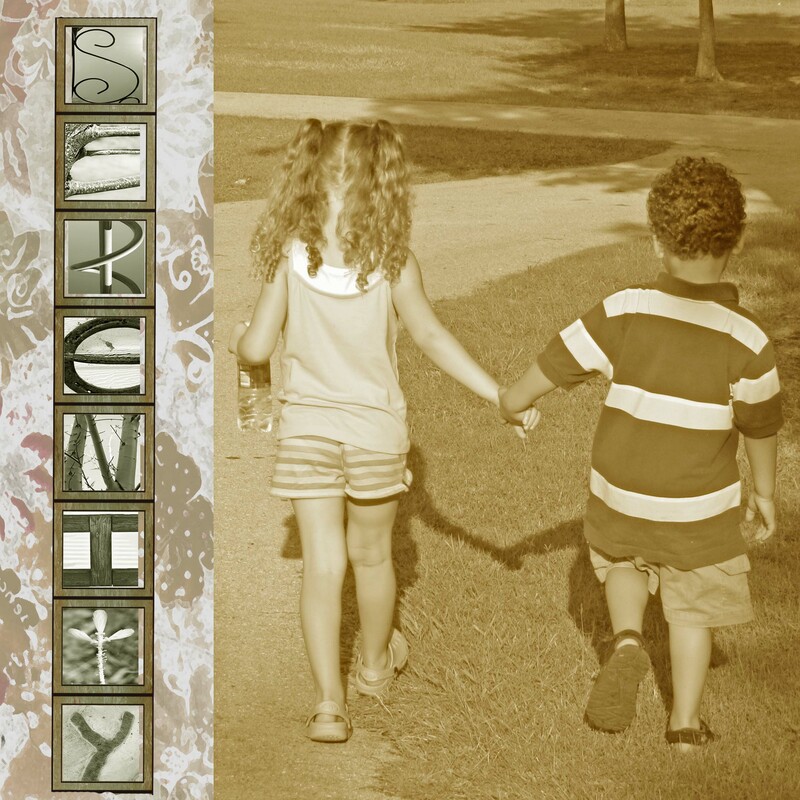 The second page I spelled “serenity” and featured a photo of my children during a precious moment. If you know anything about sibling rivalry among children close in age, this photo captures a rare occasion. So, I’m glad I was able to capture it with my camera to include in this adorable page layout. The wall “Inspire Me” wall hanging is going to be put on the wall of my craft room. There are so many creative ways to use these letters. For more ideas on how to use these letters visit the “Get Ideas Here “ page. If you are interested in Jodi’s letter pack, then here’s great news: Jodi teamed up with Makobi Scribe and is offering readers exclusive discounted pricing of up to $6 Off! Please visit her website, and take a look at all she has to offer and the great ideas for using her images. Then go to Buy Alphabet Photos. This link is only posted in this review for readers to take advantage of, so remember you won’t be able to find it on her website. In addition to the promotional discount, Jodi also offered readers a Freebie alphabet set to go along with your purchase. And here’s the great part – you get to choose a Damask set from 6 different galleries! More information about this freebie when you check out her special provided through the special link above. This promotional discount and freebie offer expires Saturday, June 11 at midnight so be sure you take advantage of this great deal while it lasts. So, go stop on over to her website and check out all that she has to offer to make your next creative photo projects unique. You can also visit Jodi’s face book page and click “Like” to find more info and receive future promotions.